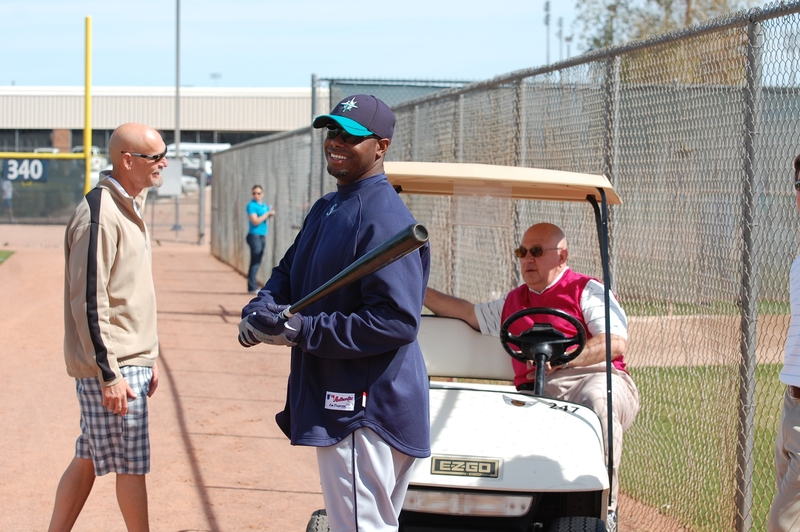 One of the best sluggers in franchise history showed off his pitchman skills at camp today. Jay Buhner is spending a few days at Spring Training introducing players to the “axe” a bat being produced by Federal Way-based Baden Sports, a company that had produced a maple bat that has a unique axe-shaped handle and less likely to splinter the way so many other maple bats have done in the past few years. The bats have received provisional approval from Major League Baseball and is being made available to Mariners players, mostly Minor League players who do not have contracts with other bat-making companies. Buhner stopped by the media room at the Peoria Sports Complex, along with Baden sales manager Rusty Trudeau, to show off the new bats. Besides the safety issue, the design of the bat’s handle could significantly reduce the number of broken hamate bones, fitting more comfortably in the bottom hand. “It’s a big-time different feeling but it’s a good concept,” Hannahan said. “I think it should catch on and a lot of guys will be using them. I used one for a couple rounds of BP and have to use it more in cage to get a better feel for it before I use it in a game, but as I said, it’s a great concept. The annual FanFest, Peoria-style, occurs Saturday at Peoria Stadium. The Mariners will work out first — at 9 a.m. — followed by the Padres, who have shared the Spring Training facility with the Mariners since 1993. Camp is beginning to drag just a little for us veteran scribes here. There is a limit to how many grounders fielders can field (or not) to make things exciting. I have noticed, however, that there are a lot more fans around than previous years. Mariners fever is alive and well. But things will start cookin’ here soon. There will be an intrasquad game on Monday after the fundamentals and a shorter one on Tuesday morning before the players head off to play golf against the Padres. My tee-time has not been confirmed so guess I’m not invited. Looks like longtime pal and confidant Kirby Arnold of the Everett Herald (the only other writer here that plays golf) will be having our own tourney. Maybe we’ll challenge the Padres writers. Manager Don Wakamatsu spent extra time on the field after the workout to watch first-round Draft choice Dustin Ackley work out at second base.